New Brunswick (French: Nouveau-Brunswick) is one of Canada's three Maritime provinces, and the only constitutionally bilingual province (French and English) in the country. The province's "name was chosen as a compliment to [the British] King George III (1760-1820) who was descended from the House of Brunswick." Its capital is Fredericton, which was also named after the second son of King George III, Prince Frederick Augustus, Duke of York. 3.1 4000 B.C.E. - 1 C.E. New Brunswick constitutes part of the historic heartland of the French settlement of Acadia and, consequently, a large minority (approx. 35 percent) is French-speaking. The province continues to be known for its rich natural resources, friendly people, and thriving bilingual and multicultural population. New Brunswick is bounded on the north by Quebec's Gaspé Peninsula and Chaleur Bay, in the east by the Gulf of Saint Lawrence and Northumberland Strait, and in the south, by the the Bay of Fundy, which has the highest tide in the world, with a rise of 16m. On the west, the province borders the American state of Maine. The narrow Isthmus of Chignecto connects New Brunswick to the Nova Scotia peninsula. New Brunswick differs from the other Maritime provinces physiographically, climatologically and ethnoculturally. Both Nova Scotia and Prince Edward Island are either wholly or nearly surrounded by water and oceanic effects therefore tend to define their climate, economy and culture. 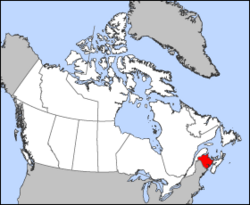 New Brunswick, on the other hand, although having a significant seacoast, is sheltered from the Atlantic Ocean proper and has a large interior that is removed from oceanic influences. The climate therefore tends to be more continental than maritime. The settlement patterns and the economy of New Brunswick are also based more on its river systems than on its seacoasts. The major river systems in the province include the Saint John River, Petitcodiac River, Miramichi River, Saint Croix River, Kennebecasis River and the Restigouche River. New Brunswick lies entirely within the Appalachian Mountain range. The eastern and central part of the province consists of the New Brunswick Lowland. The Caledonia Highlands and Saint Croix Highlands extend along the Bay of Fundy coast, reaching elevations of 300 metres. The northwestern part of the province is comprised of the remote and more rugged Miramichi Highlands, as well as the Chaleur Uplands and the Notre Dame Mountains with a maximum elevation at Mount Carleton of 820 metres. The total land and water area is 72,908 kms², 80 percent of which is forested. Agricultural land is found mostly in the upper Saint John River valley, with lesser amounts of farmland in the southeast of the province. The major urban centers lie in the southern third of the province. Metropolitan Moncton (Moncton, Riverview, Dieppe) with a population of 126,424 (Canada 2006 census) is the largest urban center in the province. Metropolitan Saint John (Saint John, Quispamsis, Rothesay) is a close second at 122,389. Greater Fredericton has a census agglomeration population of 85,000. Moncton is the fastest growing metropolitan area in the province, and amongst the top ten fastest growing urban areas in Canada. Its economy is principally based on the transportation, distribution, commercial and retail sectors. Moncton has a sizeable francophone Acadian minority (35 percent) and was the first officially bilingual city in the country. Saint John is one of the largest shipping ports in Canada (in terms of gross tonnage) and is the home of Canada's largest oil refinery. An terminal is being constructed in the city and in addition, there are major oil fired and nuclear power plants also located in the greater Saint John vicinity. Saint John has hopes to become a major energy hub for the east coast. Fredericton, the capital of the province, is home to the Beaverbrook Art Gallery, and the University of New Brunswick. Canada's largest military base is located in nearby Oromocto. 4000 B.C.E. - 1 C.E. The indigenous peoples of New Brunswick include the Mi'kmaq (Micmac), Maliseet (Wolastoqiyik - "people of the good river" (now the Saint John) and Passamaquoddy (Panwapskewiyik). The Mi'kmaq territories are mostly in the east of the province. The Maliseets are situated along the Wolastoq (Saint John River) and the Passamaquoddy nation in the southwest, around Passamaquoddy Bay. Native Americans have occupied New Brunswick since c. 4000 B.C.E. The first known exploration of New Brunswick was by French explorer Jacques Cartier in 1534. The next French contact was in 1604, when a party led by Pierre Dugua (Sieur de Monts) and Samuel de Champlain set up a camp for the winter on Saint Croix Island between New Brunswick and Maine. The colony was relocated the following year across the Bay of Fundy to Port Royal. Over the next 150 years, other French settlements and seigneuries were founded along the Saint John River, the upper Bay of Fundy region and in the Tantramar Marshes at Beaubassin, and finally at Saint Pierre (the site of present day Bathurst). The whole Maritime region (as well as parts of Maine) were at that time proclaimed to be part of the French colony Acadia. One of the provisions of the Treaty of Utrecht of 1713 was the surrender of peninsular Nova Scotia to the British. The bulk of the Acadian population now found themselves residing in the new British colony of Nova Scotia. The remainder of Acadia (including the New Brunswick region) was only lightly populated and poorly defended. To protect their territorial interests in what remained of Acadia, France, in 1750, built two forts (Fort Beausejour and Fort Gaspareaux) along the frontier with Nova Scotia at either end of the Isthmus of Chignecto. A major French fortification (Fortress Louisbourg) was also built on Ile Royale, but the function of this fort was mostly to defend the approaches to the colony of Canada, and not Acadia. As part of the Seven Years' War (1756-1763), the British extended their control to include all of New Brunswick. Fort Beausejour (near Sackville) was captured by a British force commanded by Lt. Col. Robert Monckton in 1755. Acadians of the nearby Beaubassin and Petitcodiac regions were subsequently expelled in the Great Upheaval. Some of the Acadians in the Petitcodiac and Memramcook region escaped and under the leadership of Joseph Broussard continued to conduct guerrilla action against the British forces for a couple of years. Other actions in the war included British expeditions up the Saint John River in both 1758 and 1759. Fort Anne (Fredericton) fell during the 1759 campaign and following this, all of present day New Brunswick came under British control. After the Seven Years' War, most of New Brunswick and parts of Maine were incorporated as Sunbury County into the colony of Nova Scotia. New Brunswick's relative location away from the Atlantic coastline hindered settlement during the post war period, although there were a few exceptions such as the coming of New England Planters to the Sackville region and the arrival of German speaking "Pennsylvania Dutch" settlers to Moncton in 1766. In both cases, they occupied lands previously settled by expelled Acadians. The coming of the Revolutionary War had little effect on the New Brunswick region, aside from an attack on Fort Cumberland (the renamed Fort Beausejour) by rebel sympathizers led by Johnathon Eddy. Significant population growth would not occur in the region until Britain convinced refugee Loyalists from the United States to settle in the area following the war. With the arrival of these Loyalist refugees in Parrtown (Saint John) in 1783, the need to politically organise the territory became acute. The British colonial administrators in Halifax felt that the regions west of the Isthmus of Chignecto were too remote to allow for effective governance. As a result, the colony of New Brunswick was created by Sir Thomas Carleton on August 16, 1784. During the late eighteenth and early ninteenth centuries, some deported Acadians from Nova Scotia found their way back to "Acadie" where they settled mostly along the eastern and northern shores of the new colony of New Brunswick. Here they lived in relative (and in many ways self-imposed) isolation. Other immigration to New Brunswick in the early part of the ninteenth century was from the west country of England and from Scotland, and also from Waterford, Ireland, often having come through or having lived in Newfoundland prior. A large influx of settlers arrived in New Brunswick in 1845 from Ireland as a result of the Potato Famine. Many of these people settled in Saint John or Chatham. The north-western border between Maine and New Brunswick had not been defined by the Treaty of Paris (1783) that had ended the Revolutionary War. By the late 1830s, population growth and competing lumber interests in the area forced the need for a definite boundary. In the winter of 1838-1839, the situation quickly deteriorated with both Maine and New Brunswick calling out their respective militias. The "Aroostook War" was bloodless, and the boundary was subsequently settled by the Webster-Ashburton Treaty of 1842. Throughout the ninteenth century, shipbuilding, both on the Bay of Fundy shore and also on the Miramichi, was the dominant industry in New Brunswick. The Marco Polo, the fastest clipper ship ever built, was launched from Saint John in 1851. Resource-based industries such as logging and farming were also important factors of the New Brunswick economy. New Brunswick was one of the four original provinces of Canada and entered into the Canadian Confederation in 1867. The Charlottetown Conference of 1864 had originally been intended only to discuss a Maritime Union, but concerns over the American Civil War as well as Fenian activity along the border led to an interest in expanding the scope of the union. This interest arose from the Province of Canada (formerly Upper and Lower Canada, later Ontario and Quebec) and a request was made by the Canadians to the Maritimers to have the meeting agenda altered. Many residents of the Maritimes wanted no part of this larger Confederation for fear that their interests and concerns would be ignored in a wider union. Many politicians who supported confederation, such as Sir Samuel Leonard Tilley, New Brunswick's best-known Father of Confederation, found themselves without a seat after the next election. Following Confederation, these fears were proven right as new national policies and trade barriers adopted by the central government disrupted the historic trading relationship between the Maritime Provinces and New England. The situation in New Brunswick was exacerbated by the Great Fire of 1877 in Saint John and by the decline of the wooden shipbuilding industry. Skilled workers were forced to move to other parts of Canada or to the United States, but as the twentieth century dawned, the province's economy began to expand again. Manufacturing gained strength with the construction of several cotton and textile mills and, in the crucial forestry sector, the sawmills that had dotted inland sections of the province gave way to larger pulp and paper mills. Nevertheless, unemployment remained high and the Great Depression provided another setback. Two influential families, the Irvings and the McCains, emerged from the depression to begin to modernise and vertically integrate the provincial economy. The Acadians were traditionally isolated from the English speakers that dominated the rest of the province. Government services were often not available in French, and the infrastructure in predominantly francophone areas was noticeably less evolved than in the rest of the province. This changed with the election of premier Louis Robichaud in 1960. He embarked on the ambitious Equal Opportunity Plan in which education, rural road maintenance, and health care fell under the sole jurisdiction of a provincial government that insisted on equal coverage of all areas of the province. County councils were abolished with the rural areas coming under direct provincial jurisdiction. The 1969 Official Languages Act made French an official language. New Brunswick has a unicameral legislature with 55 seats. Elections are held at least every five years but may be called at any time by the Lieutenant Governor (the vice-regal representative) on consultation with the Premier. The Premier is the leader of the party that holds the most seats in the legislature. There are two dominant political parties in New Brunswick, the Liberal Party and the Progressive Conservative Party. While consistently polling approximately 10 percent of the electoral vote since the early 1980s, the New Democratic Party has elected few members to the Legislative Assembly. From time to time, other parties such as the Confederation of Regions Party have held seats in the legislature, but only on the strength of a strong protest vote. The dynamics of New Brunswick politics are different from those of other provinces in Canada. The lack of a dominant urban centre in the province means that the government has to be responsive to issues affecting all areas of the province. In addition, the presence of a large francophone minority dictates that consensus politics is necessary, even when there is a majority government present. In this manner, the ebb and flow of New Brunswick provincial politics parallels the federal stage. Since 1960, the province has elected young bilingual leaders. This combination of attributes permits the premiers of New Brunswick to be influential players on the federal stage. Former Premier Bernard Lord (Progressive Conservative) has been touted as a potential leader of the Conservative Party of Canada. Frank McKenna (premier, 1987 - 1997), had been considered to be a front-runner to succeed Prime Minister Paul Martin. Richard Hatfield (premier, 1970 -1987) played an active role in the patriation of the Canadian constitution and creation of the Canadian Charter of Rights and Freedoms. Louis Robichaud (premier, 1960 -1970) was responsible for a wide range of social reforms. On September 18, 2006, the Liberals won a majority with 29 out of 55 seats, making 38-year old Shawn Graham the new Premier of New Brunswick. There is a distinct cultural divide in the province created by the two founding linguistic groups with their separate historical roots. The English-speaking and Acadian French cultures rarely merge. As described by Arthur Doyle, an invisible line separates the two cultures beginning on the eastern outskirts of Moncton and running diagonally across the province to Grand Falls. Nineteenth century New Brunswick was influenced by colonial ties to England and also by geographical proximity to New England. These influences were promulgated most forcefully by printed matter—the Illustrated London News for example, as well as by numerous American publications. As a society founded in forestry and seaborne endeavours, a tradition of lumber camp songs and sea chanties prevailed. Poetry—whether put to music or not—was a common form of commemorating shared events. Other cultural expression was found in family gatherings and the church; both French and English cultures saw a long and early influence of ecclesiastical architecture, with Western European and American influences dominating, rather than any particular vernacular sense. Poets produced the first important literary contributions in the province. Cousins Bliss Carman and Sir Charles G. D. Roberts found inspiration in the landscape of the province, as would later writers as well. In painting, individual artists such as Anthony Flower worked in obscurity, either through design or neglect. Few nineteenth century artists emerged but those who did often benefited from fine arts training at Mount Allison University in Sackville, which began in 1854. The program came into its own under John A. Hammond (serving from 1893 to 1916). Alex Colville and Lawren Harris later studied and taught art there. Both Christopher Pratt and Mary Pratt were trained at Mount Allison. The university’s art gallery, which opened in 1895 and is named for its patron John Owens of Saint John, is Canada’s oldest. (It actually opened in Saint John ten years earlier, but was moved to Sackville.) In French-speaking New Brunswick, it would not be until the 1960s that a comparable institution was founded in the University of Moncton. Then, a cultural renaissance occurred under the influence of Acadian historians and such teachers as Claude Roussel; through coffee houses, music and protest. An outpouring of Acadian art, literature and music has pressed on unabated since that time. Popular exponents of modern Acadian literature and music include Antonine Maillet and Edith Butler. The New Brunswick Lieutenant Governor, Herménégilde Chiasson is also a poet. The Beaverbrook Art Gallery in Fredericton has a large collection of world class art. Additionally, the performing arts have a long tradition in New Brunswick, dating back to travelling road shows and nineteenth century opera in Saint John. One example, the early crooner Henry Burr was discovered at the Imperial Theatre in Saint John. The most important proponent of theatre today is Theatre New Brunswick (TNB), based in Fredericton, which tours plays around the province. Canadian playwright Norm Foster saw his early works premiere at TNB. Other live theatre troops include Theatre L'Escaouette in Moncton and Live Bait Theatre in Sackville. In modern literature, the writers Alfred Bailey and Alden Nowlan dominated the New Brunswick literary scene in the latter third of the twentieth century. The world renowned literary critic Northrup Frye was influenced by his upbringing in Moncton. The expatriate British poet John Thompson, who settled outside Sackville, proved influential in his short lived career. David Adams Richards, born in the Miramichi has become a well respected Governor-General's Award winning author. The Atlantic Ballet Theatre of Canada, based in Moncton, has featured Russian and European trained dancers, and has started touring both nationally and internationally. Symphony New Brunswick, based in Saint John, also tours extensively in the province. New Brunswick has a modern service based economy dominated by the finance, insurance, health care and educational sectors. In addition to the above; heavy industry is found in Saint John, Fredericton is dominated by government services, universities and the military, and Moncton is a commercial, retail, transportation and distribution centre with important rail and air terminal facilities. The rural economy is best known for forestry, mining, mixed farming and fishing. The most valuable crop is potatoes, while the most valuable fish catches are lobster and scallops. Tourism is becoming increasingly important, especially in the Passamaquoddy region (dominated by the resort town of St. Andrews), and in the southeast of the province, centred by Moncton and Shediac. The largest employers are the Irving group of companies, several large multinational forest companies, the Government of New Brunswick, and the McCain group of companies. New Brunswick has a comprehensive parallel anglophone and francophone public school system serving from kindergarten to grade 12. There are also several secular or religious private schools in the province, such as the university preparatory Rothesay Netherwood School. The New Brunswick Community College system has campuses in all regions of the province. This comprehensive trade school system offers roughly parallel programs in both official languages at either francophone or anglophone campuses. Each campus, however, tends to have areas of concentration to allow for specialization. There are also a number of private colleges for specialised training in the province, such as the Moncton Flight College; one of the top pilot training academies in Canada. The province has a number of outstanding popular tourist attractions. These include the New Brunswick Museum, Kouchibouguac National Park, Mactaquac Provincial Park, the Beaverbrook Art Gallery, King's Landing Historical Settlement, Village Historique Acadien, Les Jardins de la Republique, Parlee Beach, Hopewell Rocks, La Dune de Bouctouche, Saint John Reversing Falls, Magnetic Hill Zoo, Crystal Palace, Cape Jourimain National Wildlife Preserve, Sackville Waterfowl Park, Fundy National Park and the 41 km Fundy Hiking Trail. Like all of Canada's provinces, New Brunswick has a thriving multicultural population. According to the 2001 Canadian census, the largest ethnic group in New Brunswick is French (26.9 percent), followed by English (22.9 percent), Irish (18.9 percent), Scottish (17.7 percent), [German (3.8 percent), Acadian (3.6 percent), and First Nations(Amerindian)(3.3 percent) - although nearly 60 percent of all respondents also identified their ethnicity as "Canadian." It should be noted that the proportion of Quebec's population who chose "French" was only slightly higher than New Brunswick's: 29.7 percent. Additionally, First Nations in New Brunswick include the Mi'kmaq and Wolastoqiyik (Maliseet). The first European settlers, the Acadians, are today survivors of the Great Expulsion (1755), which drove several thousand of French residents into exile in North America, the UK and France for refusing to take an oath of allegiance to King George III during the French and Indian War. Acadians, who wound up in Louisiana and other parts of the American South, are often referred to as "Cajuns." Much of the English-Canadian population of New Brunswick is descended from Loyalists who fled the American Revolution. This is commemorated in the province's motto, Spem reduxit ("hope was restored"). There is also a significant population with Irish ancestry, especially in Saint John and the Miramichi Valley. People of Scottish descent are scattered throughout the Province with higher concentrations in the Miramichi and in Campbellton. ↑ Statistics Canada, Saint John New Brunswick Census Profile, 2011. Retrieved June 19, 2012. ↑ Population and dwelling counts, for Canada, provinces and territories, 2011 and 2006 censuses. Statcan.gc.ca (February 8, 2012). Retrieved February 8, 2012. ↑ Statistics Canada, Gross domestic product, expenditure-based, by province and territory Retrieved June 19, 2012. ↑ NewBrunswick.net What's in a name? Retrieved September 19, 2007. ↑ Nova Scotia Museum (1997). Spelling Of Mi'kmaq. Retrieved 2007-04-13. ↑ CBC (September 2006). Liberals topple Lord's Tories in New Brunswick. Retrieved 2007-04-13. ↑ Statistics Canada (2002). Population by selected ethnic origins, by province and territory (2001 Census). Retrieved 2007-04-13. ↑ The Acadian Expulsion Retrieved September 19, 2007. ↑ Statistics Canada, Population and dwelling counts, for Canada provinces and territories, 2011 and 2006 censuses Retrieved June 19, 2012. Bailey, L.W. and D. R. Jack, Woods and Minerals of New Brunswick. Fredericton, 1876. Doyle, Arthur T. Front Benches & Back Rooms: A story of Corruption, Muckraking, Raw Partisanship, and Intrigue in New Brunswick. Green Tree Pub Co. 1976. Marquis, Greg. "Commemorating the Loyalists in the Loyalist City: Saint John, New Brunswick, 1883-1934." Urban History Review 33, (2004). Moody, Barry. The Acadians. Toronto: Grolier, Ltd. 1981. Summerby-Murray, Robert. "Interpreting Deindustrialised Landscapes of Atlantic Canada: Memory and Industrial Heritage in Sackville, New Brunswick." The Canadian Geographer 46, (2002). All links retrieved November 20, 2018. Historical and Genealogical Resources of New Brunswick historical census, birth marriage and death records, immigration, settlement, biography, cemeteries, burial records, land records, First Nations and more. Acadian Ancestral Home - Acadian history & genealogy storehouse. This page was last modified on 20 November 2018, at 15:50.